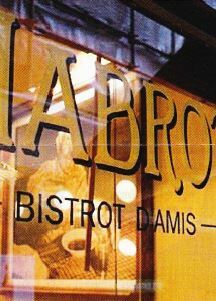 One has written of this establishment briefly in a previous post where M. Beaudoin, an eminent French restaurant critic referred to it as a little piece of France in London…or some such! With the review written in French one is sure that some readers may have had a little translating in their school French. Fear not, your Doctor has now had the opportunity to remove the eatery from his wishlist following a happy evening meal on which he can now update you. One can report that it is indeed a little piece of France. It serves very authentic cuisine and the restaurant is squeezed into a pint pot room. A menu of the day for £14.50 for two courses was very good value. One however chose to go à-la-carte. One had duck confit with canaletti beans accompanied by an excellent thick sauce. (better than Brasserie Zedel – see one’s review). Fortescue, yes none but he was in tow and chose steak (quel surprise!) and expressed some pleasure through and odd grunt here and there. All this was chased down with a reasonable carafe of Cote du Rhone. Oui, they sell wine in carafes….very French. The only thing missing was a decent supply of French bread (harrumph!). This is of course de rigeur in France. However, it was late on a Sunday night, so one must forgive them. No doubt the baker had run off for some beauty sleep. Being opposite Harrods it is pricier than one might expect but the menu of the day looks reasonable value. The young French staff were very pleasant and helpful and added to its authenticity. One noted that most of the clientele were American, so word is out and one would recommend booking ahead due to the bijou nature of the restaurant. Indeed, such has been the success of this restaurant that there is now a sister in Smithfield. Certainly worth a prod. ‹ What say you dear readers?